High ceiling goals. LOOK at this art by Cathy Lancaster hanging against Quadrille wallpaper at the store Blue Print in Dallas. 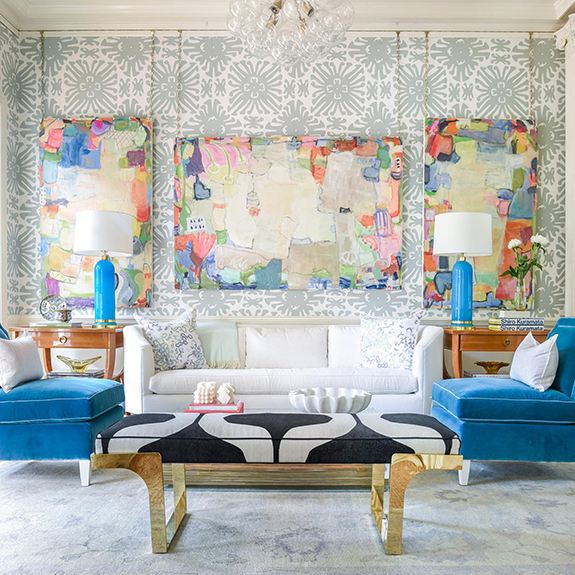 Layer in the furniture arrangement, colors, and bold large-scale pattern and the whole look just fills up your eyeballs. In the best way possible. Thought I would leave you with an especially good Crush, as I will be away from the blog next week. Hope your mid-July is going swimmingly and I will see you back here week after next. The design and pattern of this fabric is mesmerizing and loved it too.and try other kind of fabric also in my own creativity.